No. of pages: 245 pages. 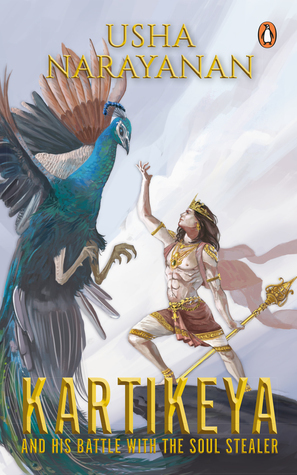 Kartikeya by Usha Narayanan is a wealth of research and storytelling and something I am sure all mythological lovers will love. While I am a huge fan of Devdutt Patnaik, in whose book reality takes precedence, I must admit, Ms. Narayanan's book has a way of entering your thought process. This is not a quick read and flipping over the pages is not a way to read this book. With this disclaimer firmly established, I must say that I am totally surprised at Ms. Narayanan's take on some of the hidden, or should I say, not much talked about topics of our Hindu Mythology. Another parallel I must draw here is the Shiva Trilogy by Amish Tripathi where the mystical realm takes over. Where the Gods and the Goddesses descend as mere mortals and you can have a deeper understanding as to how it would have been if Shiva was amongst us. Ms. Narayanan has not taken either of the paths. She has firmly walked on retelling the mythological tale with a huge dose of imagination. You would soon question what is real and where imagination sets in. That is what kept me glued to this book till I didn't flip over the last page. So what did I find unique about this tale? Not being a stranger to mythological tales, I am astounded as of how every story is told differently in different parts of the world. For eg. I was under the impression that Ganesha was the elder one. I was also under the impression the Kartikeya was the son of Parvati and Shiva and the story of how Valli is born - astounded me. It made me question how the same acts would be interpreted in modern India. I had some shocking 'educational' moments here. A very well researched book by Usha Narayanan, I must say. Coming to the main story - what you will find in this book is the story of a young boy, who rose from being Oliver Twist to the Lord of the three worlds. Ok bad picturizing but that is what had come to my mind while reading it. Born out of unique circumstances, Kartikeya is brought up by Ganges till Parvati does not seek him out to claim him as her own. He is of course born for a reason and to fulfill his destiny, he undergoes many trials and tribulations. Loads of incidents that keep you from losing interest and of course, when the romance of Kartikeya starts, you can't help but wait with bated breath as to whom he was going to choose. Let me not spoil that for you. The only issue I had with this book was that it took me some time to get into it. The number of character introduction in the first few chapters kept me guessing as to how the story was progressing. As it is Hindu mythology has a plethora of Gods and Goddesses and every God with multiple names. So don't take this book lightly when you start reading it. It not only brings out many valid points in our Indian mythology but also sheds lights on many questions that we had often wondered but never asked. But other than that, the characterizations etched by Ms. Narayanan is praiseworthy. Personally, I think, its something beautiful for the younger generation to read when they want to know more about our Gods and Goddesses. Another thing I noticed, especially in this book, is the way she handled Valli and Devasena. Ms. Narayanan has kept the power of feminism burning in her story and that is what makes this book different from other mythological tales I have read. Even the demure Devasena had a fire burning inside her. A must-read for all mythological lovers. What a beautiful review! Bless you for enjoying reading the book as much as I enjoyed writing it.